Tech is hot, and tech employers know it – in order to recruit and retain top talent, they have to pay top dollar and provide the work environments that in-demand geeks want. But is one tech employer really better than the others? 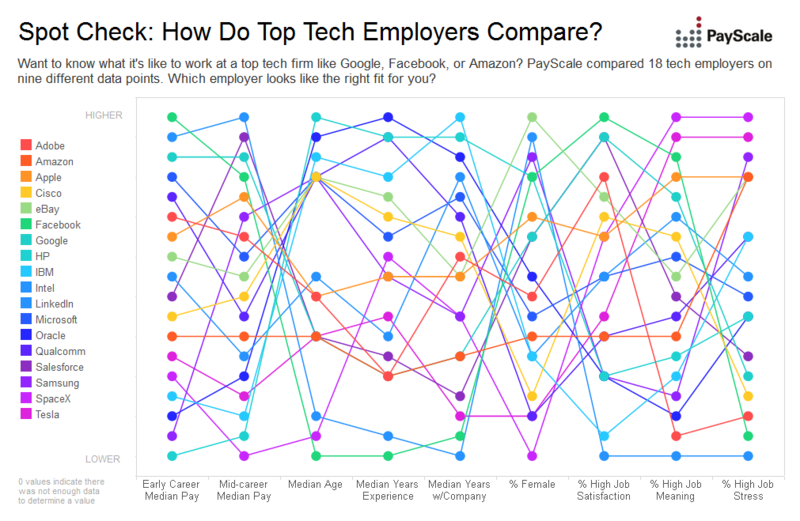 PayScale ran the numbers so that you can see how companies like Amazon, Google, Microsoft and Apple compare. We can learn a lot about the tech employers on this list, and the people who work there, from this data. Facebook certainly looks like a great place to work – not only do Facebook employees report the highest median early career salary ($116,800), but collectively, Facebook employees are the least stressed. Only 44 percent of Facebook employees say that their jobs are highly stressful. When we compare the salaries of employees with 10 or more years of experience, we see a few other companies float to the top. Experienced LinkedIn employees literally take home top dollar ($159,600), followed by people who work at Salesforce ($154,600) and Google ($151,600). A whopping 92 percent of SpaceX employees say that their jobs make the world a better place. But they have relatively low early career salaries, at least for tech, just $78,500. We didn't have enough data to report on SpaceX employees with 10 or more years of experience, but that isn't too surprising in tech, since so many employees are so young. The median age at three of the companies on our list (Facebook, LinkedIn, and SpaceX) is just 29, and only three (IBM, Oracle and HP) have a median employee age over 33. In some industries, comparing employee tenure may be a comment on how loyal employees are to a company, but that's hard to say in tech. We see that companies with the shortest typical employee tenure are also the ones that are hiring most aggressively. All those fresh faces mean they haven't had a chance to spend much time with companies like Facebook (1.1 years), Tesla (1.6 years) and Salesforce (1.8 years). What can we say about most tech workers? They are young, highly paid, and mostly male. If you want to join their numbers, it may be time to learn how to code.